One week ago, our lives changed on a dime. A shift in wind ignited a chain of events that none of us could have predicted. And while I've told the story of my own experience dozens of times for radio and television stations from across the country (and several from outside our borders), there are new memories that pop up each time - small details that got lost in the fog of crisis. It's so hard to keep up with the flow of information, both from the fire and how the world is responding to it. It's even harder to keep up with what has happened with the many phone, Facetime and Skype interviews that I have done. They started almost immediately, as I was fleeing the fire and got settled at Mark Amy Treatment Centre on that first night. 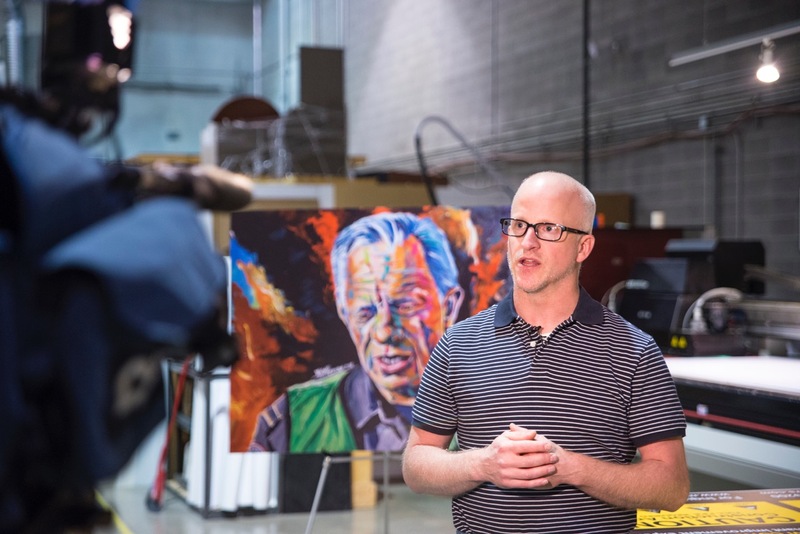 They crescendoed yesterday, as the painting of Chief Darby Allen went viral and was commented on by Premier Rachel Notley. I have had crazy media days, but nothing compared to what happened yesterday. I'm holding it together, being the stoic, articulate and accessible spokesperson that I am trained to be. But like everyone else who has been through this extraordinary event, I am in shock. It reveals itself in different ways. Stories of kindnesses being shown to our residents brings me to the brink almost every time. Images of firefighters on the ground in Fort McMurray do the same, as do new anecdotes about what happened 7 days ago and in the days that followed. I sleep well, but I don't sleep enough. Shortly after the crisis began I shifted into recovery and rebuilding mode working with amazing colleagues from The United Way of Fort McMurray and United Way affiliates across Canada eager to help. Adam and his team in Ottawa and Mike and his gang in Edmonton have been unbelievable, as have our friends at the Suncor Energy Foundation. When you're in the middle of a disaster, it is hard to think clearly, let alone do the thousand steps required to launch a fundraising effort. These men and women - many that I have never met I might add - worked through the weekend and late into the night to help us. Thinking of their sacrifices and commitment to our community brings me to tears, too. Stan, Sal and the team at Run Digital Inc. have been amazing. 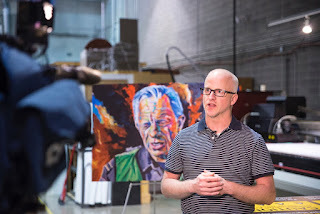 They graciously allowed several media interviews to happen yesterday and used their technology to print several large versions of the Chief Darby Allen painting. Stan and I go way back. We worked together at Q14 Stettler and Q91 Drumheller. He has given up his office for me to use for a base of operations for my United Way work. We also carpool in the morning, which allows Heather to use our one vehicle to do things with Dylan and Ben. Her car is in a parking lot at CNRL, waiting patiently for our safe return to our community when we'll be able to go and get it. Today we're going to figure out how to make prints available of the painting of Chief Darby Allen. Thanks for your patience as we figure out the logistics. 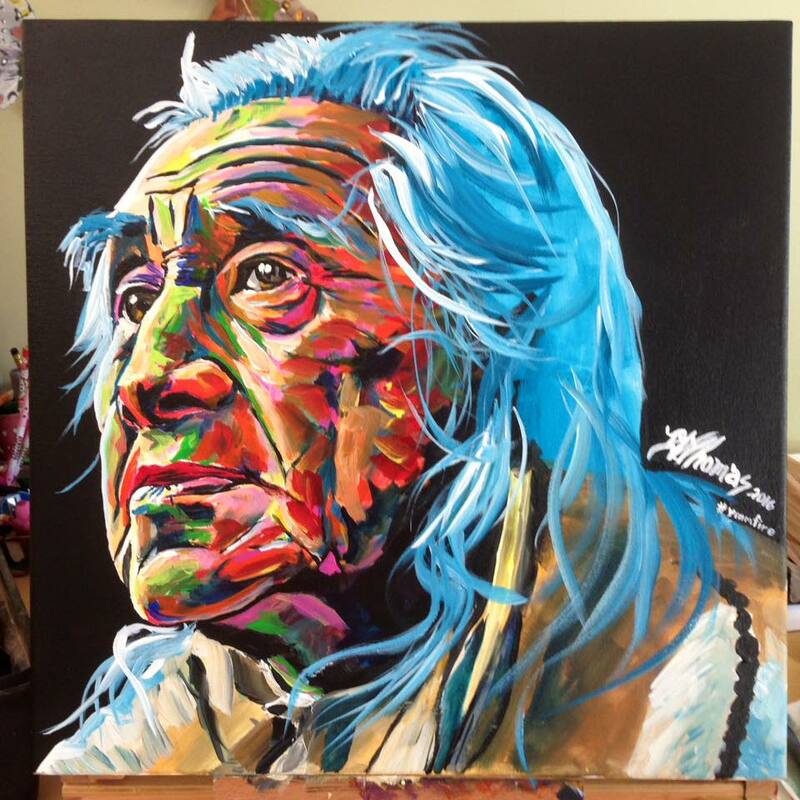 I'm also auctioning off the 16" x 16" painting of Chief Dan George and the 12" x 12" of the Horse to raise funds for www.unitedforfortmcmurray.ca. Those bids will come to a close when we return to Fort McMurray. Each of these paintings is part of the story of the #ymmfire. It's time to have breakfast, get dressed and head off to work in this altered universe that emerged from the flames, smoke and ash.